The Agriculture & Public Health Gateway — A project of the Johns Hopkins Center for a Livable Future, The Gateway provides extensive information about agriculture, public health, and the links between these two fields. The Gateway allows researchers, journalists, advocates, and educators to explore these topics by searching several comprehensive databases, or by browsing a vetted collection of reports, journal articles, and other resources. Sustainable Table — an extensive information center advocating for and celebrating local, sustainable food, and addressing issues surrounding industrial agriculture. The Meatrix Movies — award-winning satirical animations (in 30+ languages) exposing the dark truths behind factory farms and industrial meat and dairy production. Eat Well Guide — offers search and travel tools for finding fresh, locally grown and sustainably produced food, including a trip planner and downloadable guides. Accounting for Sustainability Project — works with businesses, investors, the public sector, accounting bodies, NGOs, and academics to develop practical guidance and tools for embedding sustainability into decision-making and reporting processes. Animal Welfare Approved — a program that audits and certifies family farms raising their animals humanely, outdoors on pasture or range. The Economics of Ecosystems and Biodiversity (TEEB) — an international initiative to draw attention to the global economic benefits of biodiversity, to highlight the growing costs of biodiversity loss and ecosystem degradation, and to draw together expertise from the fields of science, economics and policy to enable practical actions moving forward. Environmental Working Group — strives to protect vulnerable segments of the human population from health problems attributed to toxic contaminants, and works to replace federal policies that damage the environment and natural resources with those that invest in conservation and sustainable development. Farm Aid — raises public awareness about the plight of the American family farmer and provides assistance to families whose livelihoods depend on agriculture. Food & Tech Connect — a media company connecting decision makers with the information, technology, and people they need to fuel food system innovation through news and analysis, events, and strategy consulting. Food & Water Watch — a non-profit organization that advocates for common sense policies that will result in healthy, safe food and access to safe and affordable drinking water. The Humane Society of the United States — as the nation’s largest animal protection organization, The Humane Society works to reduce suffering and to create meaningful social change for animals by advocating for sensible public policies, investigating cruelty, working to enforce existing laws, and educating the public. Institute for Agriculture and Trade Policy (IATP) — works locally and globally at the intersection of policy and practice to ensure fair and sustainable food, farm, and trade systems. Johns Hopkins Center for a Livable Future — works to increase the body of knowledge about the interconnections among diet, food production, human health, and the natural environment in order to influence public policy toward more equitable and sustainable systems. Keep Antibiotics Working — a campaign to reduce the public health threat of antibiotic resistance, primarily by ending the overuse and misuse of antibiotics in animal agriculture. The campaign includes concerned health, consumer, agricultural, environmental, humane, and other advocacy groups. Land Stewardship Project — strives to create a food system that protects soil, water, and wildlife resources, promotes fairness and economic opportunities for family farms and rural communities, and provides safe and healthful food for everyone. Meatless Monday — a public health initiative in association with the Johns Hopkins Bloomberg School of Public Health. The goal of the campaign is to reduce the amount of meat we eat each week for personal health and the health of the planet. Since its launch in 2003, Meatless Monday has become an international movement with support from celebrities, universities, and organizations around the world. Natural Resources Defense Council (NRDC) — uses law, science, and the support of 1.3 million members and online activists to solve the most pressing environmental issues we face today. Their comprehensive site includes an outstanding section about global warming. Network for New Energy Choices (NNEC) — a project that promotes environmentally responsible energy policies and technologies, features an Energy and Agriculture minisite that looks at how food production has become increasingly dependent on energy derived from fossil fuels. The Pew Commission on Industrial Farm Animal Production — an independent commission formed to conduct a comprehensive assessment of the farm animal industry’s impact on public health, the environment, communities, and animal health and well-being. 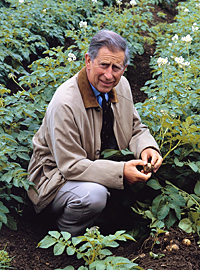 The Prince of Wales’ International Sustainability Unit (ISU) — Inspired by HRH The Prince of Wales, ISU works to facilitate consensus on how to resolve some of the key environmental challenges facing the world, specifically those to do with food security, ecosystem resilience, and the depletion of Natural Capital. Slow Food USA — Through international and national advocacy, local projects, and bringing people together through the common language of food, Slow Food strives to make it easier to access real food that is good for those who eat it, good for those who produce it, and good for the planet. Sustainable Agriculture & Food Systems Funders (SAFSF) — a broad international network of grantmakers that works to foster communication, shared learning, and information exchange about issues connected to sustainable agriculture and food systems. The Sustainable Food Trust — as a global voice for the Sustainable Food Movement, the Sustainable Food Trust works with a range of organizations to enable the transition to more sustainable food and farming. Brown, Lester. “The Great Food Crisis of 2011.” www.foreignpolicy.com. January 10, 2011. Boyle, J. Patrick. “Corn Ethanol: Burning Up Food Budgets.” The Lincoln Journal Star Online. www.journalstar.com. April 19, 2011. The Economist. “No Easy Fix.” www.economist.com. February 24, 2011. Food and Agriculture Organization (FAO). Global Food Losses and Food Waste. Rome: FAO, 2011. Gleick, P.H. “Making Every Drop Count.” Scientific American 284 (February 2001): 40-45.
International Assessment of Agricultural Knowledge, Science and Technology for Development (IAASTD). Agriculture at a Crossroads. IAASTD, April 2008. Pimentel, David. “Soil Erosion: A Food and Environmental Threat.” Journal of Environment, Development and Sustainability 8 (March 2006): 119-137. Pollan, Michael. The Omnivore’s Dilemma: The Search for a Perfect Meal in a Fast-Food World. London: Bloomsbury Publishing. 2007. The Prince’s Charities’ International Sustainability Unit (ISU). Transitioning to Sustainable and Resilient Fisheries. London: ISU, March 2011. United Nations Environment Programme (UNEP). Towards a Green Economy: Pathways to Sustainable Development and Poverty Eradication. UNEP, 2011. A Perfect Storm — Sir John Beddington, Chief Scientific Adviser to the UK Government, looks forward to the year 2030 to discuss the world’s anticipated food, water, and energy needs. Growing Enough Food In a Changing Climate — Sir John Beddington, Chief Scientific Adviser to the UK Government, describes the challenges of meeting global food requirements given the impacts of climate change. "It is, I feel, our apparent reluctance to recognize the interrelated nature of the problems and therefore the solutions, that lies at the heart of our predicament and certainly on our ability to determine the future of food."